The Blazing River Freedom Band is a musical arts organization comprised of individuals dedicated to the promotion of the arts through the unique art form of community band music. 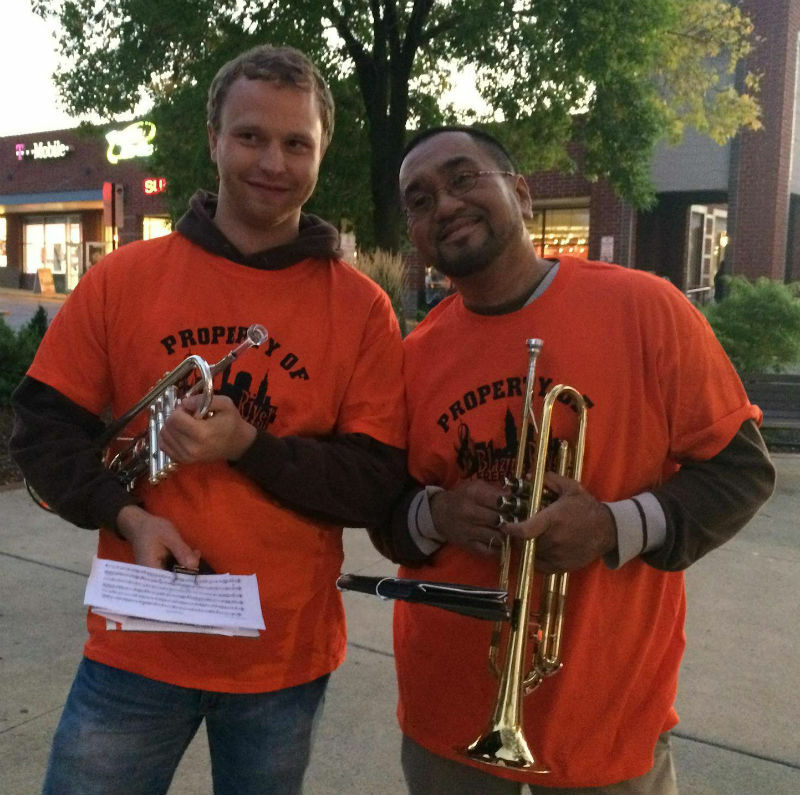 BRFB aims to foster a musical culture within its local and national community while improving the quality of artistry and musicianship of its members, one note at a time. Gay marching bands have existed since 1978 when bands were formed in San Francisco, Houston, and Los Angeles. In September of 1982 the leaders of eight independent bands from across the United States met in Chicago and agreed to form the Lesbian and Gay Bands of America (LGBA). The original LGBA member bands were from Chicago, Dallas, Houston, Los Angeles, Minneapolis, New York City, San Francisco, and Washington, D.C. The Blazing River Freedom Band was formed in September of 2003, then known as the Cleveland Lesbian/Gay/Allies Concert/Marching Band. The band began playing many events throughout 2004, including the Cleveland Pride Parade, a sit down concert, traveling and joining other LGBA bands for their pride parades, as well as having members travel to LGBA"s annual conference in Fort Lauderdale, where the band was formally accepted as a member of the Lesbian Gay Band Association. The band officially changed its name to the Blazing River Freedom Band in March of 2007. This was both to be more inclusive of everyone, as well as ease in name recognition. The LGBA was thrilled with the new name, as the group"s prior name was the longest acronym in the organization. The name of the band is a reference to a significant event in Greater Cleveland in 1969. On June 22, 1969, the Cuyahoga River caught fire. The polluted river had caught fire close to a dozen times before that dating back to 1868, but the fire in 1969 grabbed much media attention. It made Cleveland, the river, and Lake Erie a common punch line. Nicknames such as "Mistake on the Lake" were born from this event and it heightened awareness of environmental and pollution problems throughout the country. There was a positive effect to all of these events, though. Many credit the event as a catalyst for the environmental movement of the late 1960"s, as well as the passage of the Clean Water Act of 1972, and the creation of the Environmental Protection Agency, as well as the Ohio Environmental Protection Agency. Today, the Cuyahoga River is home to more than 40 species of fish. Beavers, blue herons, and bald eagles nest along the river"s banks. We chose the name for the band, as the fire is something that is never forgotten about Cleveland. And like many Clevelanders, we felt a need to take back that term and make it positive. By referring to the river as "blazing", we could easily remind people of the events of 1969, while also showing what a powerful event that was, and how much it changed the world we all live in. It was also much more fun than just calling ourselves the "Cleveland Freedom Band" or "Cleveland Pride Band".